GRAND RAPIDS, Mich. – During the company’s seventh annual Helping Hands in the Community Days – held in Minneapolis on June 22 and West Michigan on June 27 – nearly 500 SpartanNash associates volunteered a combined 3,350 hours at 32 nonprofit organizations. Groups of SpartanNash associates spent the days landscaping, building homes at West Michigan and Minneapolis Habitat for Humanity sites, volunteering at the Special Olympics Minnesota State Summer Games, preparing meals and sorting donations, among other tasks during the day of community service. “This is a special day for all of our company’s more than 15,000 associates, because we can come together to give back to our local communities in a real and impactful way,” said Dave Staples, SpartanNash president and CEO. “Helping Hands is a tradition that began in our Minnesota office seven years ago, because we recognize that the success of our company is built upon being good neighbors and partners in the communities we serve. 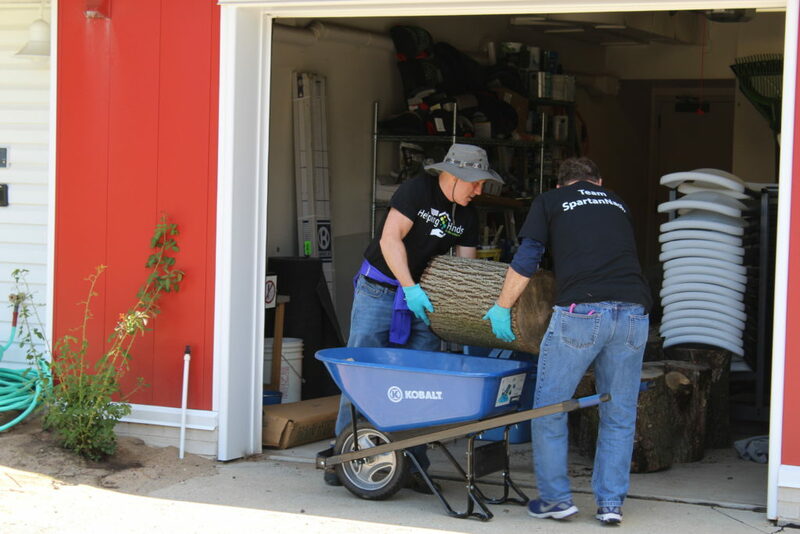 More than half of all SpartanNash associates who work at the company’s corporate headquarters in Grand Rapids, Mich. and Minneapolis Service Center participated in the Helping Hands in the Community Day, completing day-long work projects to benefit community partners. These organizations included long-time partners The Bridge for Youth, Catholic Charities of St. Paul and Minneapolis, Degage Ministries, the Grand Rapids Home for Veterans, Guiding Light, Habitat for Humanity, Loaves and Fishes, Sojourner Project and 24 other nonprofit partners. In addition to the volunteer efforts, the SpartanNash Foundation – the company’s charitable giving arm – also supports many of its Helping Hands Day nonprofit partners through its retail fundraising campaigns and grant donations. SpartanNash is the nation’s fifth-largest food distributor, with more than 150 retail grocery stores in 10 states and 2,100 independent retail customers across the country. The company is also the leading distributor of grocery products to U.S military commissaries. As part of SpartanNash’s 2016 Helping Hands Days, 533 associates from the three service centers collectively volunteered 3,324 hours for 40 community partners, resulting in $75,900 in economic impact*. Since its creation in 2011, the company’s Helping Hands volunteers have given more than 20,000 hours. The inaugural Helping Hands in the Community Day took place when then-Nash Finch employees from the company’s Edina, Minn. location spent a day volunteering together in June 2011. Since then, associates at the Minnesota Service Center have participated annually, and in 2016, the Helping Hands day was expanded to SpartanNash’s corporate headquarters in Grand Rapids, Mich. and its MDV military division in Norfolk, Va.
SpartanNash has placed a heightened commitment to volunteerism in 2017, challenging its associates from across the country to collectively give 30,000 hours of their time to volunteer efforts. Associates are encouraged to find the causes that they are most passionate about and volunteer in their local communities. To date, SpartanNash associates have collectively volunteered more than 13,000 hours. SpartanNash’s MDV military division, based in Norfolk, Va., will host its Helping Hands Day this fall.